A new update for android (version 1.0.2) has been released. This update is mainly a bug-fix and optimization update. Fixed a bug that caused the app to crash when it could not detect an internet connection. Improved optimization: The app will run faster and more stable. 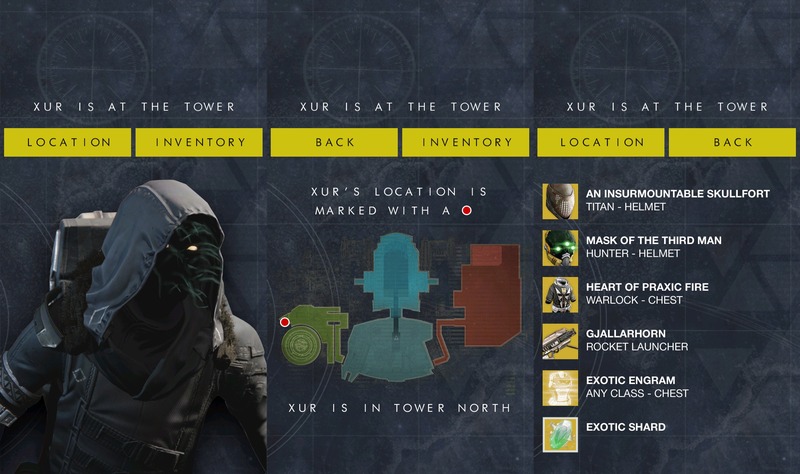 First Major Update Released – What is New with “Where is Xur?” Version 1.0.1? The first major update for “Where is Xur?” the app has been released and is live as of now. If you did not get an update notification from the Google Play yet, you can manually check within your Google Play app. What new features comes with this version? – What is new with this version? You are now able to see what Xur is selling this week and what he offered last week within the app. You can now refresh the location page without leaving the app. This eliminates the necessity of closing and relauching the app to get an update on Xur’s location. When Exactly Does Xur Arrive to the Tower and When Does He Leave? You can use the timezone converter here to find out what 09:00 AM GMT (UTC) converts to, in your timezone. So no, Xur is not really with us for the weekends. He is with us on Fridays and Saturdays. Hope this clears somethings up. “Where is Xur?” the app aims to locate and find where Xur, the most anticipated NPC of Destiny the game is and show his exact location on the Tower map as well as the exotic items he is selling for the week, with one single tap. Now that the version 1.0.1 of the app is in the market; we can move on and talk about the features I wish to implement into the app in the future. Please note that these features will be rolled out in phases and not all will be out in one major patch. In my opinion, one step a time is the best way in the app business for stable releases. Counter: In case Xur is not in the Tower yet, there will be a counter showing exactly how many days, hours, minutes and seconds are left for Xur’s arrival. The counter will not be visible once Xur arrives in the tower. Player Set Alarms: Player set alarms will let the players to set alarms for specific times of their liking. For instance, you can set an alarm for an hour before Xur departs from the tower, not to miss on anything he is selling. Local and Remote Push Notifications: Personally, I find this to be the improvement which will deliver the most value to the players. As soon as Xur’s location becomes available to check from the app, a text notification (Like the ones you get when you get a comment on your posts on Facebook) will inform the players that his exact location has been detected as well as what he sells for that particular week. Unfortunately, this feature is the most difficult one to implement as it needs development on both client and server side. However, I am eager to implement this as soon as possible. Xur’s items of the Week: What Xur is selling for that week. As the loot table of the week has to be prepared manually, the items list will not be showing up on the app immediately after Xur appears in the tower. You will still be able to see where Xur is immediately after his appearance. Perhaps, in one hour (around 05:00 AM every Friday) after Xur’s arrival to the tower the loot table will be available to see in the app. Refresh button: The refresh button will be visible if the app says that Xur is not in the tower yet. This will eliminate the necessity of killing and relauching the app to check if the location of Xur has become available. Once the app starts to show Xur’s exact location, the refresh button will no longer be visible. Here is the complete list of features I currently find that the players can benefit from. What do you think about them? I will be glad to consider your suggestions on the app, too. Feel free to comment. Game On & Happy Shopping!